The new production of A Raisin in the Sun at Park Square Theatre is a welcome revival of a classic which unfortunately serves to illustrate how little some things have changed in the half-century since the play premiered on Broadway. The play depicts a moment in the life of the Younger family, with all the action taking place in their cramped shared apartment. Widowed matriarch Lena is expecting an insurance check following the death of her husband. She wants to use the money to buy a house, to give her family something to hold onto for the future. Her son, Walter, wants money to invest in a liquor store. Walter's wife, Ruth, works hard to take care of her husband and their son, Travis. Walter's sister, Beneatha, will be able to continue her studies toward a medical degree with the money. As always when resources are short, so are tempers. Aimee K. Bryant, Darius Dotch, and Am'Ber Montgomery. At first, the Andy Boss Thrust Stage seems like an odd fit for a traditional script like A Raisin in the Sun, with its realistic-looking sets. In fact, from the side seats, it wasn't possible to see the upstage doors to a bedroom, a closet, and the hallway. But the staging, by Warren C. Bowles, ensures that the important action is visible from all angles. And the layout, with the stage at floor level and few barriers between stage and audience, makes the action of the play more intimate and immediate. Rather than observing the family in their apartment, it feels as though we are right in it with them. 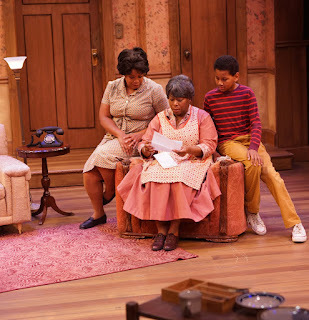 The house Lena has found is in Clybourne Park, a primarily white neighborhood. When a representative from the neighborhood association visits to pay the family not to go through with the sale, his repeated use of the phrase "you people" felt like a slap all the way out in the audience. Sadly, his agenda was identical, if sometimes phrased more delicately, to the objections of St. Cloud residents to an influx of Somali immigrants, as covered by This American Life several weeks ago. Greta Oglesby couldn't be more perfect as Lena Younger, a woman who rules her family and holds them to her high standards. Darius Dotch is all frustrated energy as Walter, trying to stake out his own place in the world. Aimee K. Bryant is sweet and resigned as Ruth, and Andre G. Miles is the repository of so many of the family's hopes as Travis. Am'Ber Montgomery's Beneatha tries to embrace her African heritage as she juggles two suitors, played with nice contrast by Cage Sebastian Pierre and Theo Langason. The performances and pacing are perfection. Park Square Theatre invited the Twin Cities Theater Bloggers to attend a matinee of the show and participate in a conversation after the show. Jamil Jude, Artistic Programming Associate at Park Square Theatre, led the discussion with Becky of Compendium and Gina of The Room Where It Happens. This discussion was what the theater is calling Park Square Musings, where audience members can stay after the show and discuss it without the cast or production team's input. The format worked wonderfully for this show, the play brings up a lot of issues that people don't often have a chance to discuss in a safe space. The show is selling fast, but if you can get tickets before it closes on November 20, you'll be glad that you experienced this classic at this tumultuous time. Check out what our blogger friends had to say about the show at the links below! Cherry and Spoon, Compendium, The Room Where It Happens, Say Entirely, Play Off the Page, Twin Cities Stages. And here's director Warren Bowles talking about the intimacy of the Boss space. 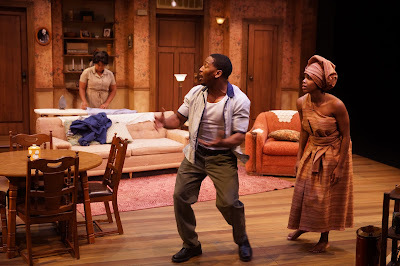 Warren C. Bowles, Director, A Raisin in the Sun from Park Square Theatre on Vimeo.